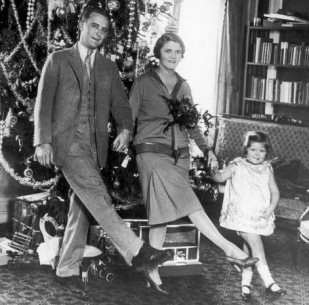 Zelda Fitzgerald was a true flapper, a woman with an extraordinary talent for living. Her vivacity was contagious and was reflected in the innumerable attentions paid to her when she was growing up, and the media’s obsession with her and her husband’s antics. While Zelda’s life was far from perfect, her eccentricity, energy, and beauty have immortalized her as an icon of the times, and artists are still fascinated with her as a muse. Paris became such an important destination for Zelda because it allowed her to escape the very real mental problems in her life. It was also an exciting artistic center where she could pursue her talents, like ballet. 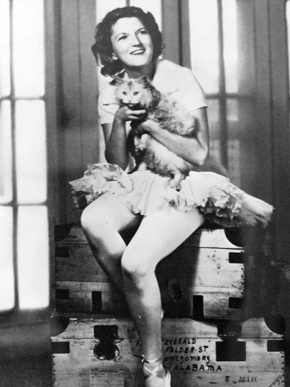 Zelda Fitzgerald’s childhood was the whirlwind that she would grow up to be. She was born Zelda Sayre to Anthony and Minnie Sayre who lived on 6 Pleasant St. in Montgomery, Alabama (“Montgomery”). Minnie encouraged her youngest daughter’s capricious and whimsical personality, which was well known among the southern aristocracy that Zelda was born to. To the surprise of Old South politicians she did cartwheels with her friends on the Alabama capitol steps where her father worked as a judge. She never truly grew out of these childish escapades and attention-seeking public scenes (Wagner-Martin, 14). As Zelda entered into adolescence she found herself on the receiving end of many displays of affection, as young men flocked to court this southern belle voted “prettiest” in her high school class. Fate intervened in her future when the promising young writer F. Scott Fitzgerald was stationed at nearby Camp Sheridan. Zelda stole Fitzgerald’s heart and captured his imagination when she performed a ballet number to the “Dance of the Hours” at a country club on April 18, 1918. She had met her match for better or worse (“The Fitzgeralds”). Scott’s love for and obsession with her would serve as fodder for numerous novels and short stories. Zelda thrived on attention, which Scott was guaranteed to give her. Scott proposed in 1919; however, a floundering Princeton dropout was not exactly the kind of man Zelda’s parents were enthusiastic about her spending the rest of her life with. Zelda broke off the engagement fearing he would not be able to support her, and so her beau returned to Manhattan. A stream of love letters both passionate and argumentative flew between the separated couple during his absence (“The Fitzgeralds”). After Fitzgerald’s novel This Side of Paradise met with public success and accepted by Scribner’s publishing house, Zelda conveniently changed her mind and accepted (“The Fitzgeralds”). The two were married a week later at an informal ceremony in New York’s St. Patrick’s Cathedral. In 1921 Zelda and Scott Fitzgerald set sail for Paris. The excursion was meant to be a source of relaxation, but the couple returned to St. Paul in October for the birth of their first child, Frances Scott Fitzgerald, who was to go by “Scottie.” The wild partying and life of excess that Zelda and her husband led soon caught up with them and in 1924 they moved to France for financial reasons. They spent this time on the French Riviera, which would serve Scott later as the setting of Tender Is the Tnight. There Zelda developed a relationship with Edouard Jozan, a young French aviator she met on the beach (Bruccoli). Though this was essentially an unconsummated trivial affair, Scott’s jealousy strained their relationship, which affected Zelda’s mental stability. Zelda came from a psychologically unstable family: her father had a mental breakdown, and both her brother and maternal grandmother committed suicide. In 1925 cracks in Zelda’s mental stability began to show. Zelda’s irrational behaviour at the Colombe D’or restaurant in St. Paul de Vence demonstrated a lack of control. Zelda and her husband were having dinner one night when Scott spotted the famed dancer Isadora Duncan at another table. Insisting on meeting Miss Duncan, and a bit drunk, he was led to her table where he fell to his knees in her praise and Isadora ran her hands through his hair dramatically. To the horror of the entire restaurant Zelda threw herself down the stairwell on the edge of the terrace (“The Fitzgeralds”). Zelda returned to Paris once more where she and her husband settled into a home on 14 Rue de Tilsitt (Bruccoli). This return to the city of lights had mainly been fueled by Zelda’s feverish desire to become a prima ballerina. She had always loved ballet, and had been relatively good, but in her youth her teacher led her to believe her talent was exceptional and that she could go further than probable. Ballet became an unhealthy obsession for her. Zelda practiced ten hours a day and seven days a week with abnormal intensity. Her behavior during this time of her life became increasingly odd. During parties she practiced ballet routines over and over to the same song on her victrola, she piled her clothes into a bathtub and set fire to them, and once she even gathered jewels from guests at a party, putting them in a pot to boil to “make soup”(“The Fitzgeralds”). On April 23, 1930, Zelda Sayre Fitzgerald suffered a mental breakdown in Paris and was committed to the Malmaison Clinic outside Paris. She eventually was diagnosed as schizophrenic. Forbidden by doctors to pursue dance anymore Zelda turned to painting and writing.In 1932 at Johns Hopkins hospital she wrote her only novel, Save Me the Waltz (“Montgomery”). The rest of her life was spent in and out of mental facilities and never again would she and Scott be the same impetuous couple they were in Paris, teasing the tabloids. Sadly, Zelda’s life came to an end on March 10, 1948. Zelda was sleeping, locked on the top floor of Highland Hospital awaiting electroshock therapy when a fire broke out. Unable to escape the blaze, Zelda died (Bruccoli). Zelda Sayre Fitzgerald embodied the passion for fast living of the 1920’s that would make her the ultimate female icon of that era. The quote she put in her high school year book speaks surprisingly profoundly of her philosophy and attitude towards life, “Why should all life be work, when we all can borrow. Let’s think only of today, and not worry about tomorrow” (“The Fitzgeralds”). 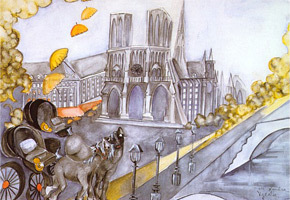 Paris had broadened Zelda’s mind to a more cosmopolitan perspective on art and literature and influenced her work in all fields of artistic pursuit. However, the city was a far cry from her Montgomery roots. Paris during the 1920s was stuffed full of beautiful, lively, and very talented people. Zelda became competitive with everyone around her, including her husband. Unable to hold the attention and adoration of all around her, she threw herself into her work. I believe that when this proved futile, and she realized this, her mind deteriorated. Therefore while Paris may have inspired, it also may have led to the destruction of Zelda Sayre Fitzgerald. Bruccoli, Matthew J. A Brief LIfe of Fitzgerald.” F. Scott Fitzgerald Centenary. University of South Carolina, 2003. Web. 26 Oct. 2010. “The Fitzgeralds.” Beautiful and Damned. N.p., n.d. Web 26 Oct. 2010. “Montgomery: Zelda and F. Scott Fitzgerald.” Southern Literary Trail. Alabama Humanities Foundation, 2010. n.p. Web. 26 Oct. 2010. Wagner-Martin, Linda. Zelda Sayre Fitzgerald: An American Woman’s Life. New York: Palgrave, 2004. Print. Without Zelda, who’s to know if there would have ever been Gatsby? F Scott was fascinated by her & driven to write these great stories. She was an ideal, she wasn’t meant to be real — nobody could possibly be able to live up to Daisy Buchanan’s beauty, her charm, her….ability to charm/hypnotize men. She inspired F Scott, who went on to create ideals in his readers of that time (and since then) — we all dream of insinuating our humdrum lives into one of Gatsby’s parties, we wish we could dive into water fountains with Zelda & Scott. The fictional women Zelda supposedly inspired where hardly inspirational. Daisy was a shallow infantile destroyer who lived with and maybe loved a monster. Others are either mad or lacking any humanity. It seems that while Fitzgerald loved Zelda, she turned him into a mysogynist. She provided him with the true villain of THE GREAT GATSBY but that is hardly a moniker any sane woman would desire, and while I loved the book, I think Zelda was more to be pitied than adored.